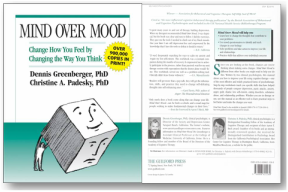 ​With over one million copies in print, Mind Over Mood​ is widely used worldwide by consumers, therapists and researchers. The 1st Edition was available in English, Spanish and 21 other languages. It was the recipient of many awards and was one of the top 10 most borrowed books in non-fiction (see details below). ​Worksheets are available online from the 1st edition - for your personal use. Please note: there are newer and many more worksheets available for the 2nd edition of MOM. What is the book Mind Over Mood about? Follow 4 people as they learn to change how they feel by changing the way they think. This self-help workbook is full of useful checklists, reminder boxes, worksheets and mood measures. 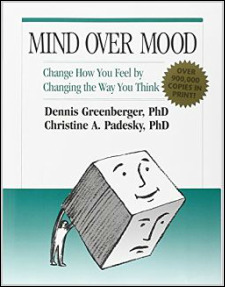 The book Mind Over Mood by Dennis Greenberger and Christine A. Padesky was chosen for inclusion in the United Kingdom National Health Service's bibliotherapy program, a selective list of proven self-help books that general practitioners, counselors, and community mental health specialists are encouraged to "prescribe" for patients with mild to moderate mental health concerns. The book was also voted by the British Association of Behavioural a﻿nd Cognitive Therapies as "the most influential cognitive behavioural therapy publication" and was recommended by Scientific American Mind. Rankings as an Amazon's Best Seller. Amazon determines rankings (updated hourly) based on recent and historic sales as well as comparisons to similar items. See statistics at bottom of page. Mind Over Mood is listed in the Reading Well Books on Prescription program in the United Kingdom. The books have all been recommended by health professionals and have been tried and tested by people with experience of living with the conditions. The program is "endorsed by health professionals and supported by public libraries." They even provide a "core book list (links to pdf document) of accredited titles recommended by healthcare professionals that covers a range of common mental health conditions such as anxiety, depression, phobias and eating disorders." Here's a brief video describing the Reading Well Books on Prescription program. Mind Over Mood appears at 31 seconds, 47 seconds, 2:09, and throughout. Click on photo below and the video will open in a new window and auto play. Average rating of 5 out of 5 stars (total of 5 reviews). One reviewer stated: "For the Spanish-speaking population there are few tools that are as good as this book."